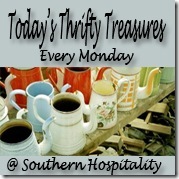 Thrifty Treasures: Oh, the Great Finds! You all continue to amaze me with all the great stuff you are finding. Makes me want to get my thrifting mojo going, but right now renovation get-it-done has taken over my entire life. We’re getting closer to a move-in ready house and I’m getting so excited. The kitchen cabinets are completely installed at this point and they look beee-utiful. I’m so happy with how they all turned out and my installer, Vic, did a fantastic job with the little custom touches that needed to be done in a small kitchen. I’ll share all of that next week. In the meantime, I’m heading to Birmingham today for a couple of days and to attend a pottery event (the same one I did a couple of years ago). It will be fun to see my blog friends in Birmingham and my friends from church that I left behind. Going back to Birmingham always gives me a little bittersweet feeling, with all that has gone on in the last 2 years, but I do have some sweet friends over there still and I love to keep in touch with them. Don’t be surprised if you see me at Joe’s in Alabaster on Monday! So, let’s take a look at what y’all found last week! There are some great finds in this feature, so enjoy. Blissfully Imperfect made me smile really big with this old aqua rotary phone. Oh, how I remember these and I know many of you do too! My parents had these for the longest and finally got rid of them all in the last decade or so. Do you remember how long it took to dial a number on one of these babies? I sure do! A $5 brass lamp got Daisy Mae Belle all excited and this one is beautifully traditional and not at all too shiny. A vintage chair find got a complete overhaul from Five Eleven Décor and she put together a pretty fab gallery wall mostly from Etsy finds. Christina, The Frugal Homemaker got a steal of a deal $18.75 at a thriftstore and she has big plans to make a headboard out of this one. What a neat ram’s head that Home-ology found while thrifting. He is right at home on her table top. I love painted furniture and Life Begins at 40 scored this piece and made it over to fit her décor. Bravo! My New Yorker friend, Meredith (and Gwyneth), went dumpster diving again and put together this nifty duo. The chest she found curbside and paired it with a hutch she already had. How cool is this? And she even added textured wallpaper to it all before painting it that pretty gray. Smart girl! Her signature pink shines in the backdrop. My sweet friend, Sheila from Note Songs, scored big time on this set of canisters for $20 and she is doing the happy dance of thrifting thrill. Any link that is titled, “Oh My Lord” always gets my attention. A lucky $10 yardsale find, this wooden rolling cart got cleaned up and now put to good use in Posed Perfection’s kitchen. Six for $165!! Wow, did Restore Interiors steal these beauties, upholstered French style chairs. Me likey very much! A collection of doors was turned into a pretty backyard focal point by Shabby Love. Hoarding old doors DOES come in handy! Be still my heart! Sophia found this beauty at a thriftstore and promptly updated her with one of my new fave Annie Sloan chalk paint colors, Florence. She looks like she could be from Italy for sure. Love! Sweet Chaos found this sweet vintage spindle bed from Craigslist for $50. She’s going to give it a new life. And last but not least, this beautiful makeover by We Heart DIY, is just stunning. A thriftstore find, this piece was the typical cherry finish in not so good shape. After a complete makeover, she is gorgeous now. I’m loving these 2 toned dressers I’m seeing all over blogland lately. What do you think of this trend? Did you score something fun this week too? There are a TON of parties out there to highlight all your projects, so please let’s keep this one about thrifty finds that were bought 2nd hand! Not a great sale from the store, or a recipe, or just a plain project, but 2nd Hand finds only! And please DO NOT go back in your archives to OLD posts and link up. Let’s keep this party fresh and current! If you have already shared your find in a previous party, DON’T share it again! Please, girls, I don’t want to have to delete links. Add your permalink to the link list, which is the actual post that you did for this party, NOT your general blog url. To get the actual post, after you publish the post, just click on the title and THAT will be your party post url. PLEASE try to get the correct url in the first time! Please add my button to your post or blog OR at least link back to this post in your post. That’s all I ask. It’s common courtesy to link back to the person having the party, so that all of your readers can find it too. Please do NOT link to an Etsy shop or something similar (even if you think it’s a fabulous deal) or I will delete the link. This party is for sharing thrifty finds from yardsales, thriftstores, or something along those lines. If I see that your post is not really on track with this theme AND you don’t link back, I’ll delete your link. Sorry, but I’d like to keep the party consistent! IF YOU SEE THAT YOUR LINK HAS BEEN DELETED, IT IS PROBABLY BECAUSE IT IS NOT IN LINE WITH THIS PARTY THEME. Again this year, I’ll be highlighting great finds from the party, so if you want your find highlighted, PLEASE link back to the party. Only those who link back will be considered for highlighting the next week. Thanks! thanks for hosting – I LOVE this party 🙂 Linking and visiting to see everyone else’s finds. Thanks so much for hosting Rhoda! great finds, as usual! thanks so much for hosting, & thanks for feature my little ram! Love seeing what others are finding in their junking expeditions. Such fun! Thanks for hosting, Rhoda. Have a lovely week. Thanks so much for featuring my gallery wall and velvet chair. I love seeing everyone’s finds-inspires me to get back out there after striking out like I did last weekend. Happy treasure hunting! Thank you for hosting the party. Enjoy your time in Birmingham. Thanks for hosting the party Rhoda. Of course I love the two toned painted furniture you featured, you always have such good taste. Some of the two toned furniture pieces are paint free in places that I wouldn’t have expected, there are some super talented people in blog-world. You can learn so much just from browsing through the links – love blog parties!